Straight A Builders came into existence in October 2001 as a sole proprietorship and was incorporated in January 2003. In the first years, Straight A Builders completed framing over sixty custom homes along with numerous additions, porches, decks, and remodeling projects. Trent quickly transitioned to project management and general contracting of new homes and larger remodeling projects as his experience and knowledge increased. In light of the slowdown in new home construction, Straight A Builders has currently been focused on General Contracting basement finishing projects, remodeling kitchens and baths, and additions. Trent also recently invested in new design software to highlight his drafting and design capability to the remodeling, addition, or new home customer. "While there are fewer jobs to compete for overall these days," says Trent about the economy, "Personal service from only the most qualified, detail oriented carpenters and subcontractors has only gotten better." Straight A Builders was started by Trent Vander Zee with help from his father Richard and his accountant John Kamp, CPA. Trent comes from a family with a tradition of commitment to excellence in carpentry among other things. Rich Vander Zee learned carpentry from his cousin Rich and his uncle George DeJong. Rich's father John, Trent's grandfather, was a carpenter as well. Trent's dad, Rich, was also a school teacher and college professor much of his life. Rich and his wife, Birdie, who was also a teacher, were committed to academic excellence. This dedication was reflected in all seven of their children and so, particularly for those that know the family, it was only fitting that Trent's business be named "Straight A" adding the slogan "Home work done right." This same commitment to excellence is shown in the attitude and work of Straight A Builders' employees and subcontractors. They have demonstrated the ability to be hardworking, honest, and flexible. The many years of experience of Trent and the crew have proven to be very helpful and appreciated by customers. "As we continue making history together, our goal is to be the best at what we do, taking pride in making you, our customer, happy with our quality work." Copyright ©2013 Straight A Builders, Inc.
Straight A Builders, Inc. is a northwest Indiana general contractor and subcontractor. 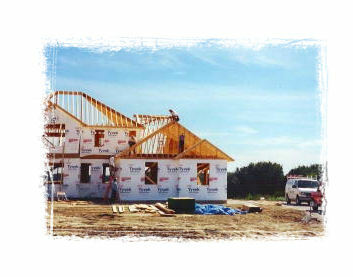 We specialize in building new custom homes, general contracting, remodeling, bathroom remodeling, kitchen remodeling, major renovations, commercial build outs, steel studs, drop ceilings, millwork installations, insurance repairs, basement finishing, additions, bonus rooms, sunrooms, decks, trim work, finish carpentry, cedar siding, soffit, window replacement, garages, and more. We are Lake County Indiana based builders servicing, but not limited to, Crown Point, St. John, Schererville, Cedar Lake, Dyer, Munster, Lowell, Merrillville, Hobart, Hammond and Highland, IN. Please call for a free estimate: 219-661-9124.